"The asteroid hurtling toward the earth will kill billions. 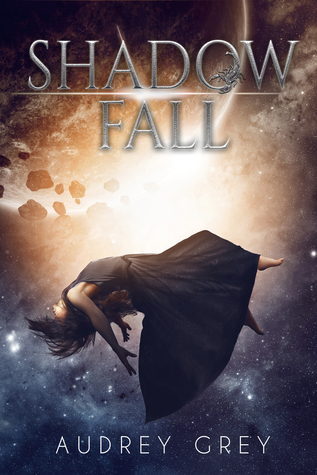 Shadow Fall is a dark and violent dystopia that explores the worst humanity has to give when faced with extreme circumstances and the fear of extinction. Plot: After being caught stealing food, Maia Graystone was thrown into the Pit, an underground prison where only the most vicious and murderous survive. With her father dead and abandoned by her mother, her years are spent in the dark with no hope of every leaving it. When Nicolais, an enigmatic benefactor, gives her the opportunity to fight in the Shadow Fall Trials and save her young brother from the end of the world, Maia takes it, even if it means become someone else, Lady Everly March, and kill the ruthless Emperor, who has condemned Earth to death. Confusing. I don’t know if it is because English isn’t my first language, but I found the beginning was confusing. I felt something was missing. I wish there was some more description or another introduction to Maia and the world she lives in. The novel starts with Maia being hunted in the tunnels (long before you know that she is in the Pit and what it is) and it is not easy to understand what is going on. Slow paced. I found the story slow paced at the beginning. The first half of the book was very difficult to read because it was very slow. When Maia finally reaches the Island and is faced with the Court – where she sees the mother that abandoned her - it was when the story finally picked up for me (so if you think about giving up, I promise you that the ending is much better than the beginning). Shadow Fall does have a few elements that remind me of The Hunger Games (not complaining since it’s my favourite dystopia), but the plot is still original and entertaining. I wish there had been more than one trial because I loved how unique (and dangerous and mysterious) the labyrinth Grey created was. But in the end, I quite enjoyed Maia’s journey. There were even some surprising twists in the end. I can’t wait to know what happens next. Luckily, Shadow Rise has already been published and I don’t have to wait to plunge into this world again. Characters: There was a lot of evil in the inhabitants of this shattered world – especially in the Golds who lived in the court. Even the Emperor promoted brutally and mayhem. I wanted to hug Maia. After so many years in the Pit, surrounded by its violence and darkness, she is traumatized. Returning to the outside world isn’t an easy task for her – especially when she is faced with a decrepit world. After being reconstructed, Maia is confronted with the girl she used to be and with whom she became, Everly March, a cold and ruthless Gold fallen from grace. She struggles to comprehend who she wants to be, cowardly Maia or cold-blooded Everly. I wish there wasn't a love triangle in the making because I hate a heroine with a flickering heart. But, at least, Maia realizes that her conflicted feelings may not be as real as she may think – she was genetically perfected to match Caspian and was manipulated during her reconstruction to care about Riser. Worldbuilding: I’m a Greek mythology geek, so I loved how much influence Greek mythology had on this dystopia – from Maia’s name to Pandora, the asteroid that is just a few days away from crashing against the Earth (all the calamities provoked by its approach reminded me so much of Pandora’s tale and how she set evil lose in the world). Even the castes seemed to be influenced by Greek mythology (Golden Age, Silver Age, Bronze Age). The science-fiction aspects were also very interesting. I love Greek Mythology but I kinda don't have patience for slow moving tales. SO I might have to skip it. I understand you, since I also don't have patience for slow moving tales. I usually put the book aside and give up. But I'm glad I didn't DFN this one because the story does pick up halfway through and has a few interesting twists.